Interactive VR short film Asteroids!, the follow-up to Emmy award-winning VR short Invasion! 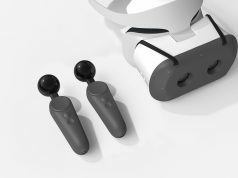 (2016) is now available for Gear VR, Daydream, and Windows MR headsets. 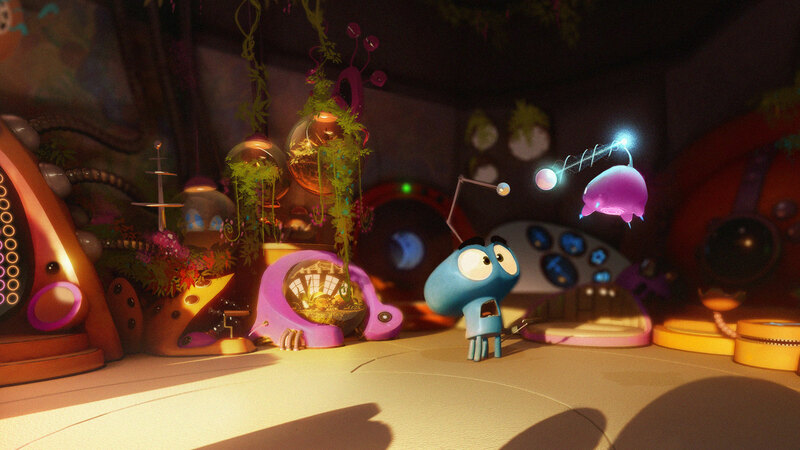 From the director of the Madagascar franchise, the full 11-minute cut continues the journey of aliens Mac and Cheez (and robot sidekick Peas) on their deep space mission. Baobab Studios announced Asteroids! at Oculus Connect 3 in 2016, and has since made an interactive preview of the animation available on Gear VR and Daydream platforms. A 360 video ‘sneak peek’ has also been available in various forms, including the iOS and Android Baobab app. Today, the full version of Asteroids! is available for free across several platforms. The best experience can be found on Gear VR, Daydream, and Windows Mixed Reality devices, where the animation is rendered in real-time 3D. Sadly, unlike their first short, Asteroids! is not currently available on PSVR, HTC Vive, or Oculus Rift, despite its considerably more interactive design. Invasion! was the team’s first foray into VR animation, and was a polished experience, but ended all too quickly. It was later slightly extended with an intro narrated by Ethan Hawke, but this felt like an afterthought, and didn’t offer the viewer what was really needed—more time with the characters. Asteroids! is a major improvement, being longer, with more complex animation and now interactivity. 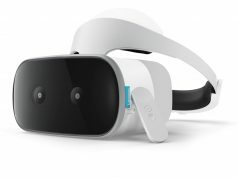 Follow these links to download the Gear VR, Daydream, and Windows Mixed Reality real-time versions. The non-interactive 360 video version of the full short can be viewed via YouTube 360 and Facebook 360, or via the Baobab app for iOS and Android (which also supports the Cardboard VR viewer), but for the reasons above, it is strongly recommended to experience one of the real-time versions first. Baobab Studios is one of the largest independent VR film studios, having raised a total of $31 million in funding to date, most notably a $25 million Series B funding round in 2016 which also welcomed Larry Cutler (ex Dreamworks and Pixar) as CTO. 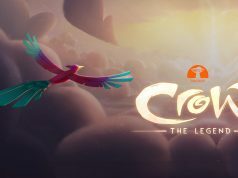 Their current project, Rainbow Crow, an adaptation of a Lenape Native American tale, is their most ambitious, presented in several chapters, and features musician John Legend. Welp, I WAS interested, but then they made it exclusive (of course!). Oh well, interest killed. On to something else. I am not sure what happen. Explain??????? Because I don’t have any of the exclusive platforms they released it on. I’m assuming it will come to other headsets in due course? Now, why is it free? Are you really expecting this to become the norm that these should be for free? All the developers really can’t live in their mommies basement and spend years in research with nerd buddies (while playing also D&D). Some of us have to pay the bills too. All kinds of bills, you know. You can’t do that if you are expected to hand out your work for free. Stop doing this for free. Now. Because they’d be hard pressed to get people to pay for something that’s 11 minutes long, probably. You want to wonder about something being given away for free, wonder about Rec Room. There’s not even a way to donate or buy a DLC hat or something. You really think they are doing this for free? They obviously get subsidised from these companies to create these promotional shorts for VR. How do you think they are getting in relatively big names, charity?